Northern Knives donates Randall Knife for Blade Show Silent Auction, a William Henry E6-5 for an AKTI drawing, and starts an AKTI supporter wristband fundraiser for the American Knife & Tool Institute’s Legislative Fund. Northern Knives http://www.northernknives.net, an Anchorage, Alaska retail store and Associate member of the American Knife & Tool Institute, has been thinking hard and working even harder to find ways to help the nonprofit advocacy organization increase AKTI’s Legislative Fund. Recognizing that making effective and reasonable changes to state laws takes a lot of both time and money, the owners of Northern Knives have made some generous donations to help raise funds for the next legislative efforts AKTI has planned to protect the rights of everyone to be able to buy, sell, make, own carry and use knives and edged tools. 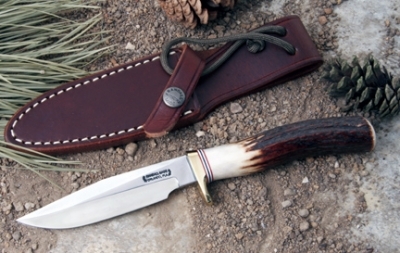 A Randall Made knife, Model 5-4, will be shown at the Blade Show in Atlanta June 10-12, 2011 and available by Silent Auction to the highest bidder. Stop by the AKTI booth #162 and place a bid on this very popular, but not easy to get, 4-inch blade Randall with a stag handle and brass hilt with black, white and red spaces. (Note: Photo is not the actual knife.) Selling for close to $500 when available, some may have to wait over five years to get one directly from the maker. The actual knife will be on display and the winning bidder can take it home after the Silent Auction closes on Sunday at 1 p.m.
Grassroots Supporters provide an email address so they can be contacted with information about the AKTI’s legislative initiative and calls to action to contact legislators or others when needed. Hearing from voters is very important to legislators and we need numbers to make effective change. Not heading to the Blade Show? Sign up at http://www.AKTI.org http://www.akti.org/membership/grassroots-supporter. Even better – make a commitment to ask at least one other knife owner to visit http://www.AKTI.org and become a free Grassroots Supporter. So visit AKTI at Booth #162 at the Blade Show in Atlanta to learn more about how this organization in working for the entire knife community. Or visit http://www.AKTI.org today and sign up as a free Grassroots Supporter or join as a member. Thank you Northern Knives for valuable ideas and action to help Keep Knives in American Lives.